These lyrics are taken from the song “Legacy of Faith,” which was dedicated for the Centennial Celebration of Falls Creek Baptist Conference Center, Sept. 2-3, and the words could be an accurate summation of the entire weekend’s purpose. Oklahoma Baptists took time to commemorate the timeless treasure of Falls Creek and its impact on countless campers over the last 100 years. 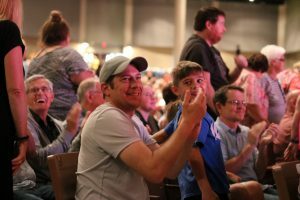 Thousands of people met at the campgrounds in the Arbuckle Mountains, coming as early as 2 p.m., when Falls Creek’s main gate opened for guests on Sun., Sept. 3. Touring the encampment, visiting the ICEE stand and sharing memories with family and friends took place before walking over to the R.A. Young Tabernacle for the Homecoming Service that evening. 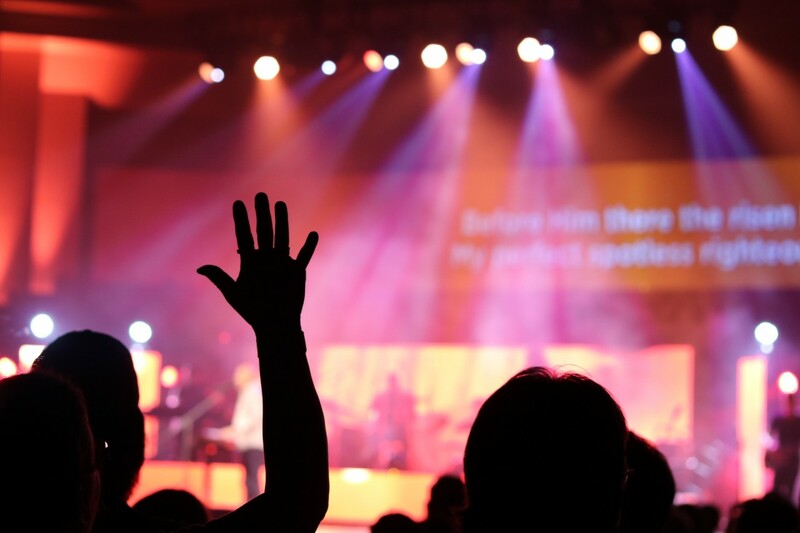 The Falls Creek Homecoming Service was Sept. 3 from 6-8 p.m. The service was broadcasted on Livestream and Facebook Live, drawing more than 25,000 viewers across the country and even the world with people as far as the Philippines tuning in. 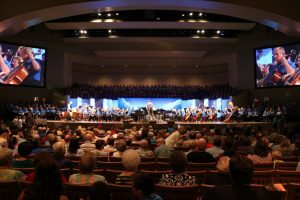 The program featured musical performances by a 500-voice Centennial Reunion Choir, the Oklahoma Baptist Symphony, Oklahoma Baptist Children’s Chorus and Native Praise Choir. 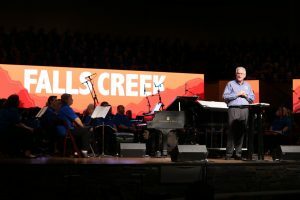 Music leaders who directed past Falls Creek summer choirs led congregational singing of some of the most cherished anthems sung at Falls Creek over the years. 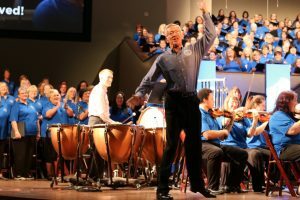 Bill Green leads the Homecoming Service in “Saved, Saved, Saved” as James Lankford plays the timpani. The highpoint of the evening for many came when Bill Green, former Falls Creek music director and former associate executive director of the Baptist General Convention of Oklahoma (BGCO), took center stage, rousing the masses to participate in a soul-stirring rendition of “Saved, Saved.” Known for his theatrics in directing, especially with this well-known hymn, Green did not disappoint. What makes “Saved, Saved” so passionate to sing under Green’s leading is the emphasis of timpani drums during the chorus. Oklahoma U.S. 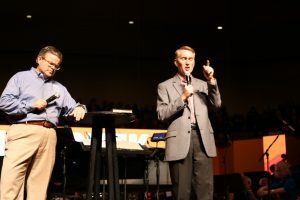 Senator James Lankford, former Falls Creek camp director, took the role as timpani player, making the moment even more memorable. Executive Director-Treasurer of the BGCO, Anthony Jordan presenting the Gospel message at the Homecoming Service. He shared that his mother, who did not have a lot of money, would pay for a young person to go to Falls Creek, and she would say she would like to pay for a “lost young person.” Jordan said contributions like what his mother would make have been observed all over Oklahoma. Jordan presented a Gospel message in his sermon and concluded with an invitation time. Green led the singing of “I Have Decided to Follow Jesus,” and pastors and ministers stood in aisles for people seeking council to make decisions for Christ. Danny Ringer, director of missions in Beckham-Mills Association and chairman of the Falls Creek Centennial Anniversary Committee, served as emcee of the Homecoming Service. During his welcome, Ringer introduced Lankford who shared his memories of serving as Falls Creek program director. U.S. Senator James Lankford stands next to Danny Ringer as he leads the Homecoming Service in prayer. Both Ringer and Lankford offered humorous reflections involving the former open-air Tabernacle and featured images on the video screens, depicting the large metal fans that were visible and needed during the hot summer nights at camp. Jokingly, Lankford held up a jar “full of bees and wasps.” He asked if there were those who were nostalgic of the old Tabernacle who wanted him to open the jar. None were willing. The Homecoming Service also featured video presentation from Oklahoma Gov. Mary Fallin who issued a proclamation of making Sept. 2-3, 2017 “Days of 100 Years of Falls Creek” in Oklahoma. Oklahoma Lt. Gov. Todd Lamb attended the Homecoming Service, sharing his reflections of Falls Creek. Oklahoma Lt. Gov. Todd Lamb made an appearance, sharing his reflections of Falls Creek. Currently a member of Oklahoma City, Quail Springs, Lamb shared his appreciation for the camp, specifically for the many church leaders and sponsors who had an impact over the years. 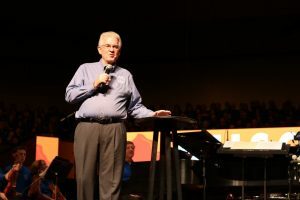 He concluded with offering a prayer for Falls Creek’s summer youth weeks in 2018. Another video presentation had John Bisagno, former pastor of Del City, First Southern and Houston, Texas, First, offer his reflecting thoughts. 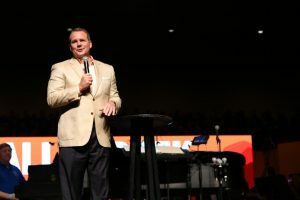 Bisagno is considered one of Falls Creek’s most popular preachers, and he made both a profession of faith in Christ and a surrender to ministry at Falls Creek when he was 18. A commemorative video also was shown, featuring multiple images that depicted the 100-year history of Falls Creek. A narrative told of Falls Creek’s founders J.B. Rounds and W.D. Moorer seeing a picture of Price’s Falls that hung in a barbershop in Davis. 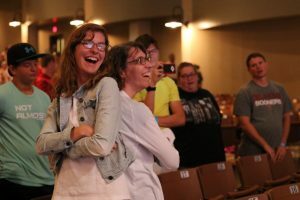 This sparked the vision, the video shared, that led to tens of thousands of young people hearing the Gospel at a 160-acre campground in the Arbuckle Mountains. “Today, as we celebrate what God has done, we continue to pray for what God will do at this special place called Falls Creek” were the concluding remarks of the video. Attendees to the Homecoming Service applaud as former camp counselors are recognized. members during the past summers. Jordan recognized many who ever preached during the summer weeks at Falls Creek. People across the Tabernacle stood when Harrison and Jordan recognize these Falls Creek summer camp contributors. Guests to the Homecoming Service sing “Lean on Me,” a favorite Falls Creek song of campers in past years. “Wherever He Leads I’ll Go” was among the songs, which was written by another legendary Falls Creek song leader B.B. McKinney. “Nobody Loves You Like Jesus” also was sung, and was written by Paul Magar, who served in the BGCO music ministry and was tragically killed in a 1991 plane crash, along with his wife, Judy; James D. Woodward, artist in residence at Oklahoma Baptist University; and Mary June Tabor, BGCO music associate. The Homecoming Service also observed a time of offering, which allowed attendees to give to Oklahoma Baptist Disaster Relief efforts, specifically to the work being done in Houston, Texas in the Hurricane Harvey aftermath. BGCO President Joe Ligon, pastor of Marlow, First, concluded the evening. In his remarks, he asked those who met their spouse at Falls Creek to stand. One couple in particular, Will and Pat Kinsey, said they met in 1952 when they were both 14. They have been married for 59 years. On Sunday afternoon, Sept. 3, Jordan led a group in a dedication service of the new Centennial Prayer Garden at Falls Creek, located with the Three Crosses above the entry creek. 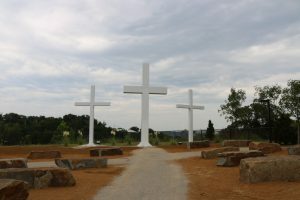 The Centennial Prayer Garden at Falls Creek, located with the Three Crosses above the entry creek. “We will not stop using the other Prayer Garden, but this one is so accessible, and you can see how beautiful it is, and we wanted a place where people could gather,” Jordan said, referring to the established Prayer Garden near Baptist Lake. Jordan also mentioned the new Prayer Garden was made possible because of offerings provided during the BGCO women’s retreat, Men’s Rewired, Indian Falls Creek, the Associational Children’s Camp this year. “It’s an effort of a lot of people, and we are thankful for that,” Jordan said. Ligon offered the dedication prayer.